State and local officials look on as Cathy and Don Jesse announce Met-South’s relocation to Hanceville. HANCEVILLE – At a special event Tuesday morning, industrial instrument and gauge maker Met-South announced that it will relocate its manufacturing operations to a new facility to be built in Hanceville. 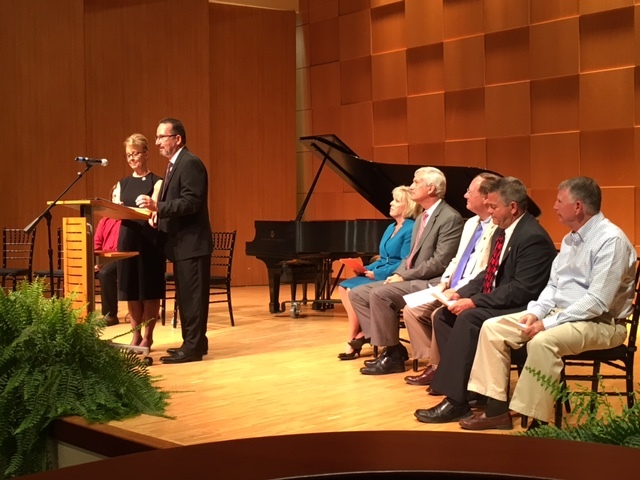 Company President Don Jesse made the announcement in front of an auditorium packed with Cullman County and Hanceville City officials, as well as state legislators and representatives of other county municipalities. Jesse cited Wallace State Community College (WSCC) and its Machine Tool Technology program as one of the primary reasons he and his wife Cathy Jesse chose to relocate here, along with the area’s ready access to Birmingham and Huntsville business markets. Met-South was located in Maplesville and Clanton, before moving to its current facility in Birmingham. “With every move, we continued to struggle to find qualified people,” said Don Jesse. Met-South supplies automotive parts manufacturers, and already has business relationships with REHAU, Topre and Yutaka, as well as companies in Tuscaloosa, Opelika, Birmingham, Huntsville and Pulaski, Tennessee. It currently employs seven workers, including three WSCC graduates, and sees an expansion in business coming with growth in its available workforce. The construction schedule is still in the works, but the Jesses hope to break ground as soon as possible, and Met-South’s Hanceville facility could be open in as little as four months.